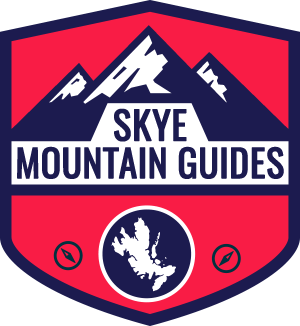 Skye Mountain Guides is a mountain guiding company based at the foot of the Black Cuillin mountains on the Isle of Skye. We offer a variety of days out, or courses, for those groups or individuals who want professional private guiding or those who want to adapt to more difficult terrain on the Cuillin Ridge. Why not get those last Munro’s like the Inaccessible Pinnacle, Sgùrr Alasdair, Am Bastier or Sgùrr nan Gillean. Experience the exposure of the magnificent Cioch (scene of the swordfight in the movie Highlander with Sean Connery & Christopher Lambert). You could try one of the many classic climbs that were first climbed by the likes of Collie and Mackenzie, Pilkington, Shadbolt and Odell. Maybe a visit to the Trotternish Ridge, The Old Man of Storr or take in the beauty of the Quiraing. We can offer many different options, whether you want to walk, scramble or climb, from the ultimate Ridge Traverse or a day out on Blaven. We also offer guiding in the French Alps and climbing in the greater ranges, also mainland Scotland, Snowdonia, Lake District and the Peak District. We hope you can find everything you need. Skye Mountain Guides is focused on providing high-quality service and customer satisfaction – we will do everything we can to meet your expectations. Tuition is also available for those who would like to improve on their mountain skills, whether it be Navigation, Rope techniques or learning to lead climb on single or multi pitch routes. There are many choices of courses or routes to choose from, or just come up with your own and we’ll tailor the day to suit. The mountains are calling and I must go….